A resident has criticised a council’s ‘rotten’ method to determine whether trees need to be chopped down, after a pair were removed near his home. David Lovegrove, and a neighbour, contacted Central Beds Council after the authority axed two trees in Danes Way, rather than trimming them. The trees had been deemed unhealthy after they failed a quick “kick test”. Mr Lovegrove said: “When my neighbour spoke to the council, about five weeks ago, she was told the trees were just going to be trimmed. “It must be cheaper for the council to chop them down than to trim them. 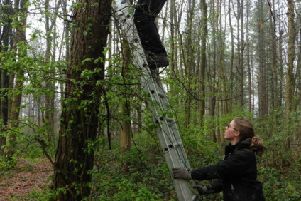 “It was a very quick process and there was no proper inspection of the trees. “The guy just kicked it and said that as it had a hollow sound, it was deemed to be rotten and a danger to anyone nearby. “He then led us to the other tree and said that as the bark on this tree was split and the kicking sound was the same as the other tree, this tree was also diseased and rotten and was also a danger to the local community. The trees were then hacked down – after 40 years or so of beautiful display. He added: “It is a shame as they were lovely trees, us and the neighbours are quite upset about it. “If there is not rot in evidence in the stump, trunk and branches - they all look strong and healthy - and there is obvious evidence of healthy leaf and blossom buds, how on earth can a tree be classed as rotten? “The stumps have been left there, they are far more dangerous now than the trees would have been.